I arrived at Washington D.C.’s posh Jefferson Hotel for my first-ever interview with George H.W. Bush the afternoon before he announced he was running for president in 1980. His family was gathered around him in his suite. Daughter Dorothy, then barely out of her teens, sat on the floor leaning up against her dad’s leg. I remember the moment because that is how he defined himself — a man at the center of his family; his family, the center of his universe. His career in public service covered so many different jobs: Congressman, briefly; candidate, often; ambassador at the U.N. and in Beijing; director of the CIA; chairman of the Republican National Committee. We used to joke that he couldn’t keep a job. But the family was a constant, including his deceptively strong-willed wife, Barbara, who kept her own firm political opinions to herself most of the time, as she worked on needlepoint projects stitching in an animal or design for each of the grandchildren as they were born. In 1980, Bush finally became Ronald Reagan’s choice as a running mate — and for eight years the vice president logged more miles on Air Force Two, and visited more foreign countries, than any predecessor. In Washington, he was personally well-liked, with friends on both sides of the political aisle. But in 1988, when he was elected to succeed President Reagan, the modest Bush national agenda did not make much in the way of history. He may be best remembered for his “thousand points of light” theme saluting private charitable outreach. The White House press corps did love decamping to Kennebunkport, Maine, each summer to cover the president, who refused that first year to return to Washington until he caught a bluefish from his beloved speedboat, Fidelity. He finally hooked one the day before we were to leave. President George H.W. 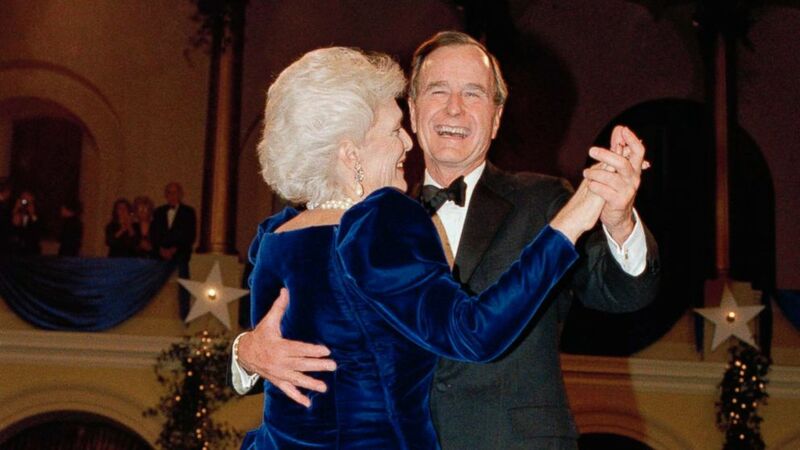 Bush and wife, Barbara dance at the inaugural ball at the Pension Building in Washington, Jan. 20, 1989. Family was always the center of attention on the grounds of the grand house on Walker’s Point. I was trailing along in the press travel pool the day he played a foursome at dawn on his favorite public course Cape Arundel, which included his cocky son, George W. The Bushes were a competitive clan with little patience. W, as his family called him, came up to me on the 18th green, poking my reporter’s notebook with his finger. “One hour, 53 minutes,” he crowed about the speed of their game. President Bush lost control of the post-Reagan economy as it sank into recession, but his most vivid challenge was Iraq. One August morning in 1990, Saddam Hussein invaded Kuwait, prompting Bush to build an international coalition for a campaign dubbed Desert Storm to repel the Iraqi forces. The president and his war cabinet retreated to Camp David for a strategy session and, when Marine One landed back at the White House a few hours later, the president stopped long enough at our ABC News camera to answer a question from me in a curt, uncharacteristically gruff way. George H.W. Bush in 1985. The next morning, I was handed an envelope hand-addressed to me, with the words “It’s Personal” underlined twice. It was a note of apology, signed with his initials “G B” and a face wearing a frown. He was a prolific note-writer, and unfailingly gracious, even to the media. His re-election loss was clearly painful for him. But, in retirement, his family surrounded and comforted the former president and, in the end, brought him fulfillment. He walked into the Oval Office on Inauguration Day in 2001, a new century, with his namesake, President George W. Bush. His family was always his proudest achievement. ABC News’ Ann Compton covered all four years of the George H.W. Bush administration and covered his family for the better part of a generation.